On request from a specialist sleep physician, the provision and appropriate dental supervision of a removable single arch (jaw) oral appliance to assist in the treatment of assessed snoring and obstructive sleep apnoea disorders. Reference should be made to the report published by the American Academy of Sleep Medicine entitled “Clinical Practice Guideline for the Treatment of Obstructive Sleep Apnoea and Snoring with Oral Appliance Therapy: An Update for 2015” as endorsed by the Australian Dental Association. Reference: Thomas SM, Chervin RD. Clinical practice guideline for the treatment of obstructive sleep apnoea and snoring with oral appliance therapy: an update for 2015. J Clin Sleep Med 2015;11(7):773–827. This is the same as item 983 but the appliance involves both jaws. 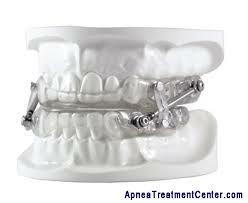 The repair/addition, reinsertion and adjustment of a snoring or sleep apnoea device. Any impression(s), if required, should be itemised. See item 776. This is a condition that can be potentially life threatening. Children in particular should not be snoring. Proper medical investigations should be carried out as to the causes of snoring. 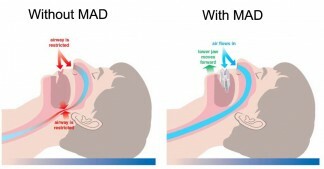 Sleep apnoea can lead to obstruction of the airway and is common in overweight people. Other side effects are grinding of the teeth. Again there are many causes of sleep apnoea and snoring, including inflamed anatomical structures in the sinuses or throat, medication, fatty tissue, postural issues, and so on. It is complex and serious. SEEK ADVICE!